Rubik's Cubes are classically frustrating on their own, but what if you want to go that extra mile and make your puzzle impossible to solve? Not only will your Rubik's Cube looker cooler, but it will finally stymie your know-it-all friends that come over and solve it in sixty seconds. Nothing is worse than somebody owning your own Cube during a party. 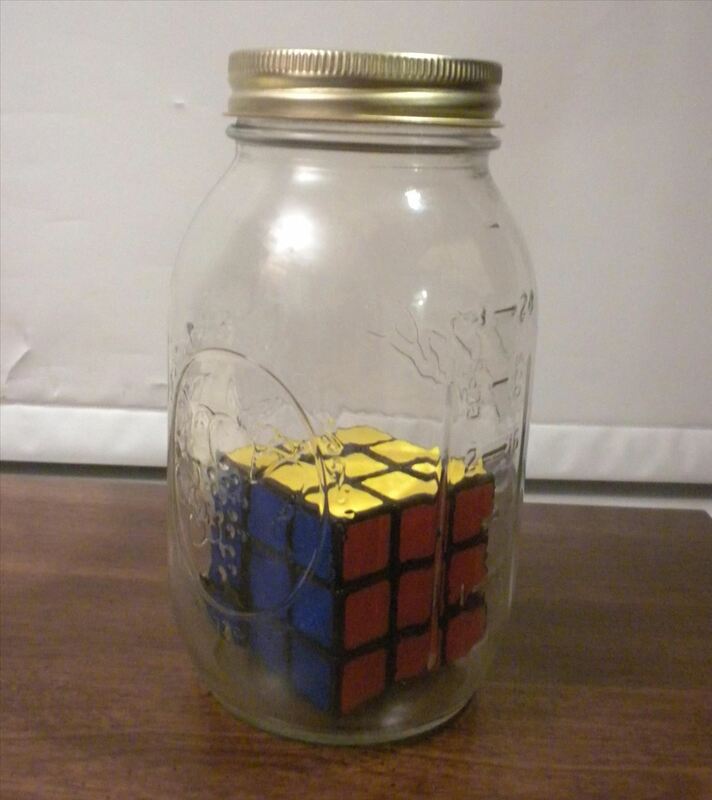 To make a Rubik's Cube in a Jar puzzle, you just need your Cube, a mason jar, and a little patience. Seriously, how else are you going to get that Cube in the jar? This is an impossible puzzle, not something that can actually be solved (not that you should tell anybody that). Just watch the video below for the full disassembly instructions. If your cube is extremely tight, you can always use some Vaseline or silicone spray to loosen it up. 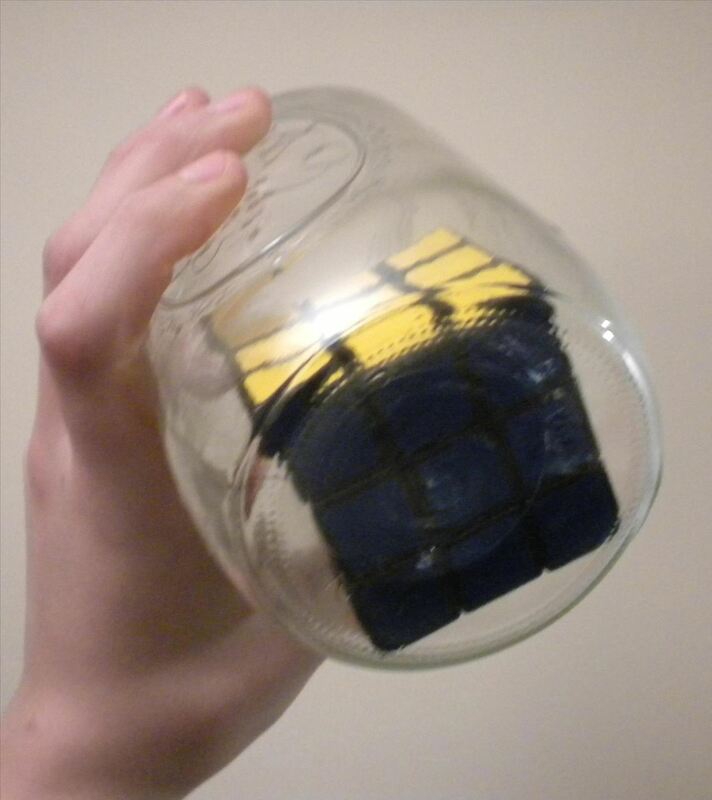 You don't have to take apart the cube all of the way, just enough to squeeze it into the jar. Now hopefully you don't have giant hands because you are going to have to put the pieces together inside of the jar. This is obviously the hardest part. If you can, try attaching as many pieces as possible to the core before placing it inside the jar, if they aren't already attached. Place the core into the mason jar, and make sure that there is enough room inside for the whole cube to fit with some extra space on the side. If not, you might need a bigger jar. For some help on the reassembly, just watch the video again, but skip to around 50 seconds. Once you get to the point where your fingers cannot place the pieces inside, try using chopsticks or a butter knife to slide those hard to reach pieces in place. 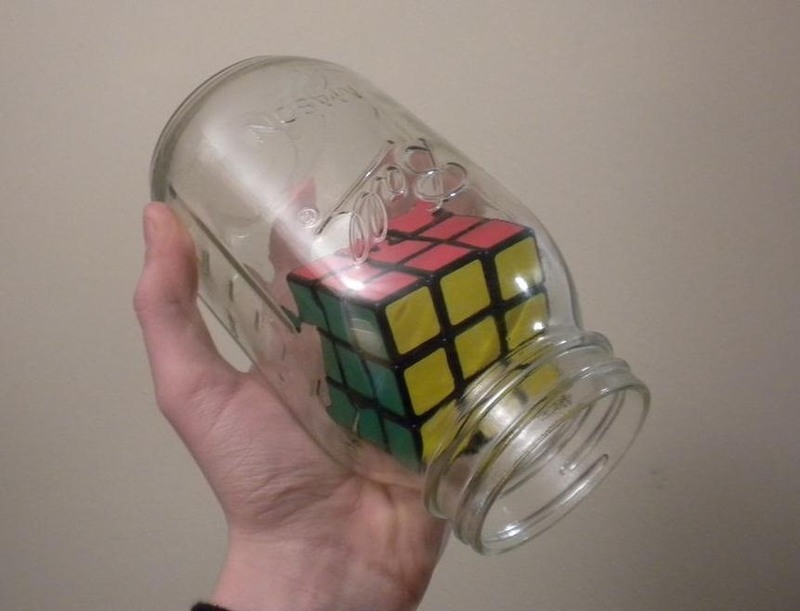 Once you've fully reassembled the Rubik's Cube inside the jar, you now have yourself an impossible puzzle to piss off your friends with. Seriously, see if they can solve it, then laugh as hard as you can as they try and try to no avail. And then prepare to have the jar smashed against the wall sending glass shards everywhere while they laugh at you having to clean up the mess and then have the last laugh by solving the Rubik's Cube.